It' been a while since last blog post in this series, but now we continue our journey. In order to support that, we have abstraction of "whole" message. Let's say that class representing "long sms" message is called "WholeMessage". And we also have message parts, which are actual SMPP messages being sent to suppliers. Class representing these parts is called MessagePart. "WholeMessage" is our central entity. This is the message from business perpective and it can represent either "long sms" or "normal sms" message. We want to track the status of WholeMessage instances because this is the message in business sense, and message parts (SMPP messages that are actually sent) are technical detail of how the message is really sent. Of course, the status of the whole message depends on statuses of all message parts that belong to it. This means that on every submit response arriving for specific part, we need to check if all other parts submit responses arrived, and if that's the case, we can update our WholeMessage instance status to "SENT" (initial status is "PENDING") . Picture bellow illustrates what we do. 1. When sending WholeMessage instances, we set it's status to PENDING and store them to Kafka topic called "sent-messages", with key being WholeMessage ID (generated by our application), and value is WholeMessage instance itself. 2. We split WholeMessage instances into one or more MessagePart instances (depending how long is the content of the message) and send them as SMPP messages to appropriate supplier. 3. When we receive "submit response" for specific SMPP message, it contains reference to the MessagePart instance we sent as well as supplier generated ID for that SMPP message. Storing MessagPart instance in memory between sending and receiving submit response is handled by SMPP library (we use Cloudhopper library). Once we got submit response, we update corresponding MessagePart instance with supplier generated ID and store it to Kafka topic called "submit-responses" using WholeMessage instance ID as key, and MessagePart itself as value. 4. Using KafkaStreams API we aggregate MessagePart instances (belonging to same WholeMessage object) from "submit-responses" topic and filter aggregates which have all parts arrived. Result of this operation is KTable with WholeMessage ID as key and MessagePartsAggregate as value. By joining this KTable with the KTable built from "sent-messages" topic we get the reference to WholeMessage instance in "sent-messages" topic and since we now know that all parts of this message are successfully sent, we can update it's status to "SENT" and send it to some other topic or external system used to store latest state of messages. 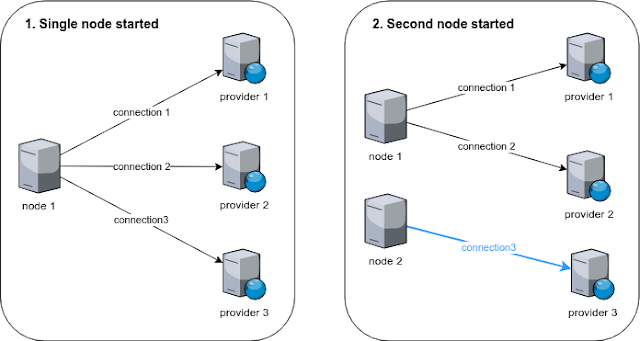 In order to join records from two KTables or KStreams, those records must have same key. This is why we used WholeMessage instance ID as a key both in "sent-messages" and "submit-responses" topics. As you see, amount of code is quite small, yet it does the job in scalable and fault tolerant way. In next post we will talk about handling delivery reports also using join and aggregate operations of KafkaStreams API. We make sending bulk SMS easy, by letting you connect your internal ... Test your integration with our gateway, or test end-to-end message delivery to handset. Nice post !! 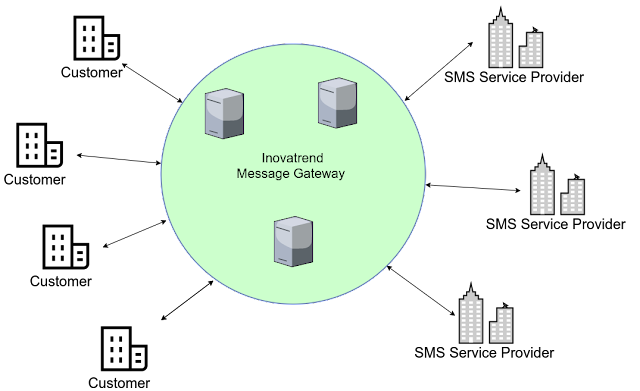 SMPP Server gateway allows an application, regardless of whether it is sending text messages to consumers; notifying staff about important information or updating remote devices.